There is herdsmanship as well as sportsmanship at the Lacamas fair. Keep your area clean, neat & accessible to the public at all times. All pens, cages & animal areas will be cleaned before you are dismissed. Animals must be kept in their designated area. Animals must be fed & watered by the owner or handler. Youth exhibitors must have a signed parent permission form. All goats should be washed & brushed. Dairy goats that are producing milk should have all of their body hair clipped to 1/4"-1/2" long. Their udder region should be shaved to the skin. Don't milk your dairy goat the morning of the fair. 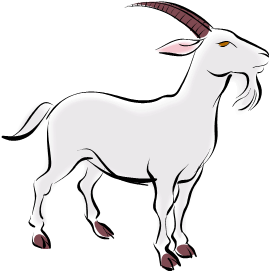 The person handling the dairy goat should be wearing a white shirt & white pants. Use a thin dog choker collar for leading your dairy goats in the show ring. Pygmy goats are led on regular collars & short leads. Their handlers wear black or dark pants. All handlers of animals should wear solid shoes - No sandals or flip flops! Adults 19 years & over may enter type classes only. Classes & lots will be at superintendent's discretion. Lots will be determined by animal's age, gender & freshening. Website design by Mythical Meadows, Inc.